Dating back 630 years, Xi'an's city wall offers visitors a fine vantage point as they zoom around its ramparts on bicycles. And as a proud civic symbol, it's a favorite spot for lovers to take a stroll, while children play in its shadow. Hege Tollerud pays a visit. Bathed in glorious spring sunshine - much welcome after a long winter - our full circle around the Xi'an city walls was an unforgettable experience. Xian, capital of Shaanxi Province in northwestern China and starting city for Silk Road tours, boasts a history of more than 3,100 years. Named Chang'an before the Ming Dynasty (1368–1644), it is one of the world's four great ancient capitals. And with all due respect to Athens, Rome and Cairo - all I cared about right now was this center of the origins of Chinese ancient civilization, situated by the Yellow River estuary in the mid-western region of the country. At more than 630 years old, Xi'an city wall is the most integrated and complete ancient city wall in China, still serving to divide the city into the inner, old city and the outer part. After catching a glimpse of it when driving through on arrival night, I had to wait until the next morning, check out a row of street stalls selling antiques along the inside of the eastern part of the wall, and pay the 40 yuan (US$6.5) admission fee (it will increase to 54 from July), before climbing up to get a closer encounter with this impressive construction. As the Xian city wall links around the inner city entirely, it is possible to walk the whole distance without any climbing down and up interruptions. Or cycle. To be fair, it adds up to just under 14 kilometers in total, so taking advantage of the excellent bicycle hire service for part of the round-trip is nothing to be embarrassed about. Rather, it's a must - especially because the option of renting a tandem with a friend makes it twice the fun. 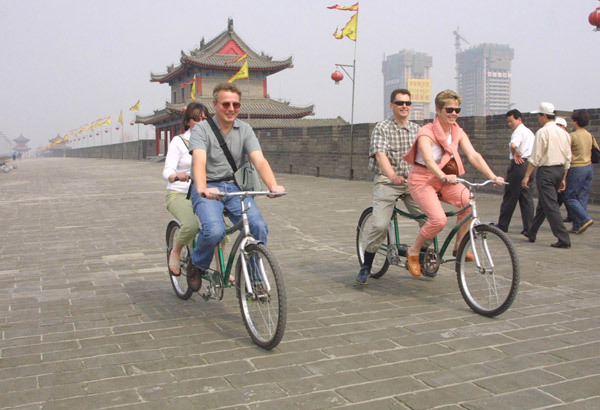 Riding on the Xian city wall is very popular activity for popular China tours. There are bicycle stations near all the main gates, and you can pick up and return at different ones. The price is 40 yuan for a single bike (and a 200 yuan deposit), 80 for a tandem, giving you 100 minutes - which should be enough time to get you all the way around! There are also golf carts that can take you around. We walked about half and cycled about half - which at a leisurely speed took about 3-4 hours in total. This included an ice-cream break, and almost zigzagging throughout, as we wanted to see everything. If you want to go faster, sign up for the Xi'an City Wall International Half Marathon! The run has taken place in early November every year since 1993, and you can also opt for the shorter versions at 13, 7 or 5km, if you don't fancy running too far. There are, in general, a lot of activities on and around the city wall all year long. The marathon is one of the main events, with more than 30,000 runners for 50 countries taking part last year. The annual Lantern Fair in January-February also attracts the crowds, and when we were exploring the wall, big preparations were under way for the Kite Festival, offering about everything you can (and cannot) imagine doing with a kite! If you visit Xian during the fair, you should not miss the fair for your China travel. We were immediately struck by how green it was everywhere, with parks and green spaces along the walls more or less on both sides all the way around. Inside the wall was where the emperor lived, as Xi'an served as the capital during 13 dynasties, between the 11th century BC and the 10th century AD. Just around the city wall was the city wall garden and a city river, which was used as a defense of the city. The Xian city wall is rectangular in shape. According to the stone tablets by the gates, it is 10-12 meters high, 12-14 meters wide at the top and 15-18 at the bottom, it stretches 4,256 meters from east to west and 2,078 from north to south, and has an outer perimeter of almost 14km. If you think it is grand today, imagine what it was like during the Tang Dynasty (AD 618-907), when the area enclosed by the city walls was apparently as much as seven times bigger. 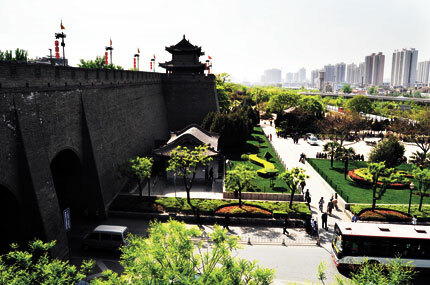 Xian city wall is always contained in the China tour packages.